Smart homes are becoming more and more common. So, it’s more likely that home buyers and sellers will turn to trusted professionals (like you!) to learn more. If you’re feeling a little overwhelmed or like you could use some more education on the topic, we’ve got you covered. Outlined below are a few technologies that are getting a lot of attention and gaining traction. There are a lot of reputable companies that are focusing their attention on these type of devices, including LG, Samsung and Kohler. For example, Kohler Konnect provides users with the ability to operate bathroom tasks through Alexa, like turning on the showerhead or flushing the toilet. In addition to these voice controlled devices, there’s no shortage of other smart home devices that are making a splash. Here are a few that are really efficient (and cool!). Have you ever wished that someone else could manage folding laundry? Your wish has been granted. Meet Laundroid. This laundry folding robot uses artificial intelligence to fold your laundry AND sort it by family member. There’s also an app where the user can create an online closet and itemize each and every piece of clothing. The current price isn’t cheap, but experts assume it will come down substantially when mass production is achieved. So, if it’s not in the budget right now, just be patient. If you’ve been on calls all day, and don’t want to use your voice any more than you have to, here’s the solution. Talon is a ring that allows users to control smart home features with hand movements. For example, you can wave your hand to make the lights go and so much more. LG recently launched their InstaView ThinQ, and it’s very smart! You can program it to provide you with automatic reminders if you’re running low on milk or need something that’s on your grocery shopping list. It also allows you to see the contents in the fridge without opening the door! Wouldn’t it be great to have a home security system that included a Wi-Fi camera, live video viewing and speakers? That’s exactly what Maximus does (and more)! You can view and control everything from a personalized app, including sounding a siren to scare away potential intruders and having the ability to contact police directly through the app. 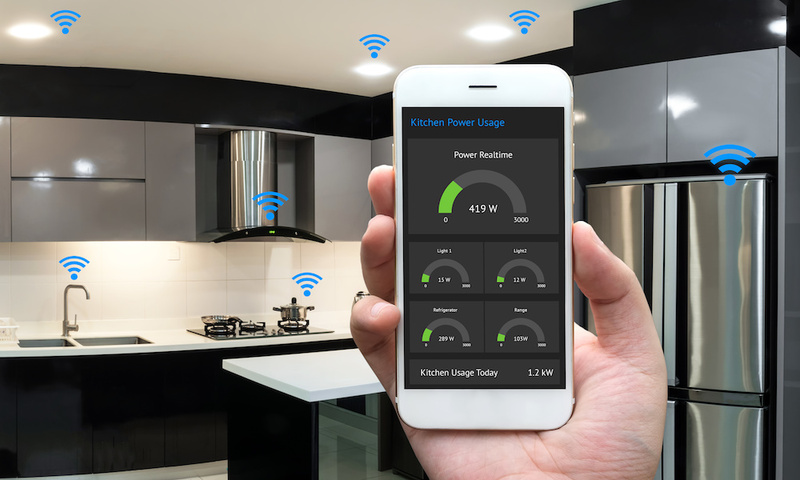 We hope that this article makes you feel more equipped in speaking about smart homes with your clients. Of course, if we can provide you with any escrow assistance or answer any questions, please contact us. We are here to help you!